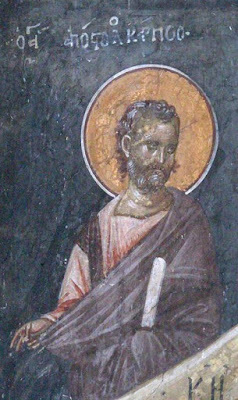 In his second Epistle to Timothy (4:13), Saint Paul requests, "The phelonion that I left at Troas with Carpos, bring when you come, and the books." 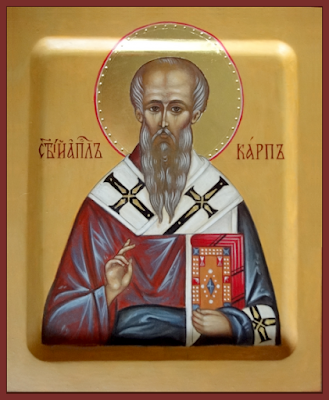 Carpos also preached the gospel in Crete where he received Saint Dionysius the Areopagite in his home. Saint Dionysius testifies in a letter that Carpos was a man with an exceptionally pure nous, with meekness and innocence, and that the Lord Jesus, with His angels, appeared to him in a vision, and that he never began the Divine Liturgy unless he did not have a heavenly vision beforehand. It happened that the Apostle Carpos lost his patience and began to pray that God send down death upon two sinful men; one a pagan and the other an apostate from the Christian faith. Then the Lord Jesus Christ Himself appeared to Carpos and said: "Strike me; I am prepared to be crucified again for the salvation of mankind." Saint Carpos related this event to Saint Dionysius the Areopagite and he wrote it down and gave it to the Church as a lesson to all, that prayers are needed for sinners to be saved and not for them to be destroyed, "for the Lord is not willing that any should perish, but that all should come to repentance" (2 Pet. 3:9). Having brought many people and cities to Christ, and divided believers from unbelievers through Holy Baptism, many unbelievers came against him, and he endured all things with bravery and courage. In as much as he glorified God even in the midst of his trials and sufferings, God glorified him. For this reason even when he reposed in peace and delivered his spirit to the Lord, his relics continued to work miracles on a daily basis, healing all types of illnesses and diseases, and banishing evil spirits from the possessed. 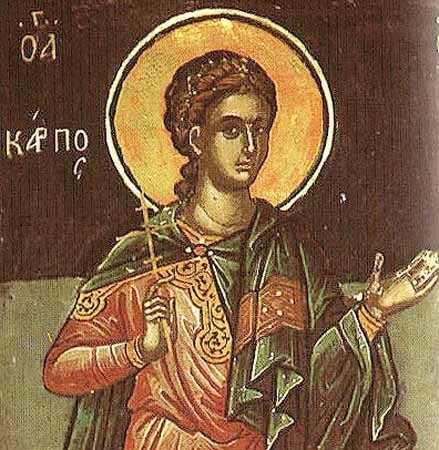 Thou didst share in Paul's bonds by divine grace, O blessed Apostle Carpos. And those who received the light of thy preaching, thou didst reveal as partakers of glory. Therefore intercede with Christ our God to grant us His great mercy. The Church has thee as a shining star, O holy Apostle Carpos, and is illuminated by thy many miracles. Save those who faithfully venerate thy memory.